Impact Wrestling this week did a good job of keeping my attention throughout the whole show. The Joker’s Wild Tournament took up the majority of the show, building up nicel into the gauntlet match, whilst there was also some nice build for next week’s special edition of Impact Wrestling, Destination X. Will Chris Sabin cash in his X Division title? 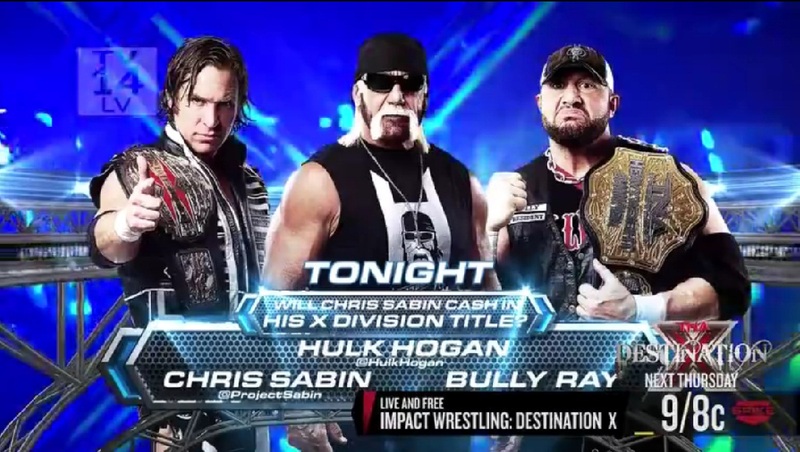 The major story of the show revolved around whether Chris Sabin would cash in the X Division Championship that he won back on last week’s Impact Wrestling. Now, I have no problem with this as a concept being the main hook of the show, however it certainly wasn’t help with Sabin announcing his decision already at the end of last week’s show. Therefore, we had an air of predictability running throughout the show. I mean what would have happened if Sabin had said no? Would Destination X just be cancelled? The other story running throughout the show was the idea that there was a new member of the Main Event Mafia. After Magnus joined the Sting, Kurt Angle and Samoa Joe last week I was intrigued to who might be joining the group. We kicked off the show with Bully Ray telling Sabin that he’d be better of not cashing in his X Division belt, as Bully will beat him anyway, especially with his family around. It was another good promo from Bully Ray, who has really found a niche in this role, still continuing to produce some of the best work of his career. Bully went on to reject the Main Event Mafia offer of a fight next week which drew the Mafia out to the entrance ramp. Kurt Angle did a good job of explaining the plan behind the challenge, stating that next week they’d take out every single member of Aces and Eights, so that the World Heavyweight Championship match would be one on one. Sting then made the announcement that the fifth member of the Main Event Mafia would be revealed later tonight. As far as opening segment’s go this one was pretty damn good, setting up bigger segments for later in the night and setting the scene for next week. There were couple of backstage segments thrown into the mix as we built towards the final segment. Firstly, we got a continuation of the Bully Ray and Brooke Hogan storyline, with General Manager Hulk Hogan asking Brooke what was going on. Brooke said she was trying to keep her business and private life separate and focus on the Knockout’s Ladder Match later on. If only Brooke had done so in the first place, we might not still be suffering this dire storyline. I can’t understand why TNA have acknowledged that Brooke has got engaged in real life, because in for one, in storyline she is still married to Bully Ray and for two, if you’re going to acknowledge a real life occurrence for Brooke, then it leaves you open for criticism when Bully Ray is also already married in real life! In other segments, we saw Sting and Angle talk up their newest recruit for the Main Event Mafia as they awaited a phonecall in what was essentially filler and didn’t add much to the show. In the final segment, we saw General Manager Hulk Hogan come out first to talk up Destination X next week and invite X Division Champion Chris Sabin out to the ring to find out his decision regarding the World Heavyweight Championship. Sabin cut a decent, if not familiar promo about how he was following his dreams by going after the World Heavweight Championship, but before he could hand over the belt, World Heavyweight Champion Bully Ray headed out to the ring and this is where the segment really found its feet for me. Bully continued to try to persuade Sabin not to cash in next week, maybe focussing a little bit too much on Hulk Hogan during his promo for my liking. It was then Sabin’s time to shine as he cut a fantastic promo, where you could see him grow in confidence as it went along. Sabin talked about how he’d already beaten Bully Ray before in Team 3D’s retirement match and kicked out of the 3D. His passion really came through the television screen and that made him feel like a perfect opponent for Bully. Originally when I heard this match might be happening I wasn’t particularly excited by it, but thanks to good work from TNA, Bully Ray and Chris Sabin in the last few weeks, I now can’t wait to see Chris Sabin get his shot at the Championship. We finished up with Aces and Eights coming out, presumably to take out Sabin, only for the Main Event Mafia to head to the ramp, reiterating their plan for next week and revealing their newest member…Rampage Jackson. This seems like a good decision for me, it allows Rampage to be visible on the product, whilst training at the same time and should make him look like a badass, building to a match with Kurt Angle somewhere down the line. Throughout the show we had a number of tag team qualifying matches for this gauntlet, with the teams picked out at random by Jeremy Borash and Christy Hemme, we’ll talk about those in more detail later on. Now, a gauntlet in TNA is unlike a gauntlet you will see in WWE or numerous other promotions, which have more of a “Winner stays on format”, a TNA gauntlet is similar to WWE’s Royal Rumble with two competitors starting the match and another entering at regular intervals. To spice things up a little once we reach the final two competitors, the match becomes a regular one on one contest. So basically what we had here was six-man royal rumble match! Now, the winner of the Gauntlet would receive 25 points in the Bound For Glory series. Now this isn’t something I was particularly happy with as the Bound For Glory Series concept should be enough on it’s own to tell the story and giving away 25 points here dilutes the other one-on-one contests that we will see later on in the Series. It also allows TNA to quickly change the ranking whenever they want, by throwing in these extra matches, which means the long term story telling that should be used for the Bond For Glory Series is lost, which will hurt the eventual winner and reduce the chance of other wrestler being elevated and new stars created. Magnus and AJ Styles started the match, with some decent action but we were basically treading water here as we waited for the next competitor to join the match. That next competitor was Bad Influence’s Kazarian. It was more of the same here, with some nice displays from Kazarian, but mainly each man trying to get each other over the tope rope. With Samoa Joe heading down to the ring the match picked up, as we began to get a bit of psychology involved, with Joe and Magnus working together to get the upper hand over Styles and Kazarian. With Styles and Kaz fighting back they then turned their attention to each other, with Styles eliminating Kazarian with a back body drop. Mr. Anderson was the next man to enter, albeit during an advert break and then Bobby Roode was the final man to enter. With five men in the ring there was a lot of pushing an shoving with one man sat in the corner which wasn’t particularly gripping stuff to watch. Some nice work between Bobby Roode and AJ Styles, lead to Styles’ elimination with Roode having him perched on the top rope, with Mr. Anderson run by with a clothesline for the elimination. Samoa Joe and Anderson were then the next to be eliminated with Joe charging at Anderson for a clothesline and both men heading over the top rope. It was a spot we’ve seen hundreds of times before, but it worked well here. Down to a final two of Bobby Roode and Magnus, the match certainly hit it’s strongest period. The two put in another solid encounter. Roode worked over Magnus, until the Brit got the upperhand by thwarting Roode’s superplex attempt, but missed his top rope elbow drop. Roode went for a Fisherman Suplex, with Magnus countering into the Mag Daddy Driver to pick up the win and the 25 points in the tournament. Another good short bout between Magnus and Roode it would be nice to see what they can do given a bit more time. Did this win do much for Magnus? Well, yes he got the 25 points and is now the runaway leader of the Bound For Glory Series, but it didn’t really help to elevate him any further than he has been in recent weeks. He’s already defeated Bobby Roode in singles action and didn’t actually eliminate any one in the battle royal. The other big match of the night was Taryn Terrell and Gail Kim in a rare knockout’s Ladder Match, with the winner becoming the number one contender for Mickie James’ Knockout Championship. After Terrel and Kim’s brutal Last Knockout Standing Match at Slammiversary there were high expectations for this one to deliver the same kind of brutality, which for the most part it delivered upon. It wasn’t exactly a wrestling classic, but that isn’t what was needed and we moved from painful spot to painful spot these women really have to be commended for what they were willing to do in the ring. Both took bumps off the ladder, with some nice worked spots including Kim locking in the figure four around the ladder and Gail ducking being irish whipped in the ladder, only for Terrell to send the ladder straight back at her. It looked like Terrell might have won the match after hanging Kim over the side of the ladder with a sleeper hold, but once Kim had fallen, Terrell was unable to grab the contract because of an injured knee thanks to Kim’s Figure Four on the Ladder, it was a nice touch to the match that really helped you get behind Taryn. The ending saw Terrell counter Kim’s Eat Defeat into a Dragon Sleeper Hold close to the ropes, only for Kim to begin to tie Terrell’s hair to the ring ropes. Kim escaped the hold and easily pulled down the contract. It was a clever ending, but didn’t really suit the match, feeling somewhat of an anti-climax. I was surprised that Kim won the match, as the logical progression would have been for Terrell to move into a program with Mickie James. However, I won’t complain about seeing Mickie James vs. Gail Kim even if we’ve seen it a load already. Elsewhere in the night, Aces and Eights voted for a new Vice President. This storyline has been going for a while with both Mr. Anderson and DOC squabbling over the position, with little real progression, so it was nice to see it concluded here. Bully Ray decided to stay out of the vote, which predictably saw each wrestle pick up a vote alternatively as we went along the line. With Wes Brisco and Garrett Bischoff voting for Mr. Anderson, and Taz and Devon choosing DOC, it went down to Knux’s vote. It seemed like DOC could count on Knux’s vote, but Knux switched and choose Anderson making him the new Vice President of Aces and Eights. It was a well done segment, but really this should have been done weeks ago. In the pick of the qualifying matches for the Joker’s Wild Gauntlet, we had Christopher Daniels teaming with Austin Aries to take on Kazarian and Bobby Roode. This is where the “random” drawing really came into it’s own, with Daniels and Kaz being adamant they would be drawn together, they refused to face off for most of the match, with the other member tagging out as soon as the other tagged in. Roode and Aries had no problem squaring off though and produced some good action, as expected. With Daniels eventually having to break up a pinfall attempt by Kazarian to keep his team in the match, we saw the first signs of trouble in Camp Bad Influence. The end saw Aries attempt a Brainbuster on Kaz only for Daniels to tag himself in and end up walking into a small package from Kazarian for the victory. There looked to be problems between Daniels and Kaz, but The Fallen Angel eventually came to, raising Kaz’s hand in victory. It was a very well worked match, with interesting psychology and solid in ring work from all four guys, who should all be considered top guys for the company. Elsewhere in the qualifying matches we saw, Jeff Hardy and Joseph Park teaming up to face Samoa Joe and AJ Styles. Now if it was Abyss teaming with Jeff Hardy we could’ve been in for an absolute classic, however it wasn’t and we weren’t. Don’t get me wrong it was bad for a four minute tag team match, but it won’t be remembered for particularly long. Styles and Joe worked over Hardy for the first few minutes, with some nice tag team work, before Hardy made the hot tag to Park. This would have worked if the audience didn’t like Joe and Styles more than they like the Park character. With Park working over Joe and Styles, he took to long to celebrate ending up getting hit with a Springboard forearm from Styles and caught in the Rear Naked Choke from Joe, leading to the submission victory for Joe and Styles. The other contest saw Jay Bradley team up with Hernandez to take on Magnus and Mr. Anderson. It was another unremarkable and short match, with some decent wrestling throughout but nothing that really made you sit up and take notice. This Bound For Glory Series is really helping Jay Bradley in my eyes though, despite not winning yet, having him as a regular on television is will definitely help him in the long run. In a nice twist ending, where many would have thought the desention would come between Magnus and Anderson, Bradley tripped Hernandez, allowing Magnus to get a roll up victory to advance. What have I learnt from this week's Impact Wrestling? 2. Magnus is clearly going to be the guy at the top of the Bound For Glory Series for a long time. 3. Gail Kim and Taryn Terrell are two of the toughest women in main stream wrestling.